Discussion in 'Games, Gaming & Game-demos' started by Stone Gargoyle, Feb 2, 2019.
now at lest viceral pushing this model EA can see how they can get players to lest play when you dont treat then like debit cards. will they keep playing? that is the unknown for them the retention, but grats viceral sticking to its guns on how this game would be handled. they deserve the praise. spajdrik, signex, cerebus23 and 1 other person like this. Having more than Fortnight is kind of amazing. -Tj- and cerebus23 like this. EA poached Epic's streamers and audience lol. BangTail and cerebus23 like this. Wait till the craze goes down and people will be back to fortnite. I dont think it will last knowing ea. EA marketing money wasn't spent on much advertisement last months.. wondering where the money went? Streamers? Game was just released, Blackout was also extremely popular on release week. Doubt anyone is dismissing AL in this thread? It's the 2nd AAA take on battleroyal from a major studio after Blackout, and it's free to play. Haven't had the chance to try for myself but the map seem really well thought out. Couldn't have said it better myself. It's awesome, just a shame myself and my friends are absolutely dire at the game! Although we still have a lot of fun. I love all the nuances to movement and combat. Everything just clicks and feels awesome. I love re-spawning, re-deploying via stations and the abilities. Hard to believe it's all running on (highly modified?) Source as well. I would be playing a lot more as well but can't stop watching Doc, Viss and Kraftyy! Talk about a dream team. Stone Gargoyle and cerebus23 like this. These games are niche they appeal to a very specific player it is good that AL peaked their interest and it is great so many are giving the game a try why not it is free, did they tweak the formula just enough to "keep it fresh" and fun going forward? adding a bot mode where people can practice to get gud before they jump into the BR proper might draw some players that would not try the game otherwise. they could add up with more avg players than blackout and that would be pretty impressive i would say for a newish IP, and a game that had zero marekting or hype before it was out in the wild if it can pull that off. fartnight is a juggernaut and its going to peter out in the next year but i doubt any one BR game is going to topple it. i been watching the same trio since the game launched and damn Viss is a hell of a player all three together make it all look way too ez Doc is Doc and has his ups and downs lol. its the first game ive actively jumped on to twitch to watch been played on a nightly basis the plays they come up with together win after win are so entertaining. they have that 50k in the bag im almost certain. Ninja is currently streaming AL to 40k on Twitch and its almost kinda strange to see him playing something outside of Fortnite he loves the game apparently. i removed my earlier post btw cos i felt like i was blowin hot air trying to convince everyone how good it is when there really is no need. cerebus23 and spajdrik like this. I guess I'm way too old to understand the beauty of watching some teenager playing a free game. BangTail, angelgraves13, kens30 and 2 others like this. well its like DOTA how many enjoy watching dota or trying to play dota or LOL? I love watching someone play dota that knows what the f they are doing, vs you not knowing what your doing getting cursed and flamed by your team. They even tried to add hand holding tutorials to try and ease players into dota. But it one of those game types that either you like it and get it or your just wandering around going why the hell am i playing this? And BG games and whatnot i bet are in the same boat a game may look more fun to watch than be to play for many that do not want to get gud or judge if it was worth their bandwitdth to check out. As long as it is getting views streamers will stream it nm why people are watching. 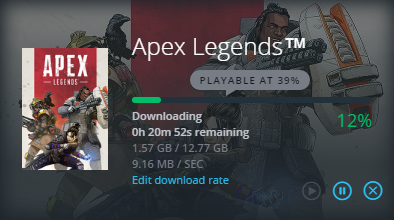 Could someone tell me how big the Origin install is for this please. That's pretty good only 12gb download.... then I guess it gets uncompressed. XenthorX and cerebus23 like this. My first round, found one enemy with team mate, killed one enemy, walked over to team mate who had killed another of the enemy squad and then crashed to this. Seems it's a common problem, there are a lot of people reporting it on the EA forums.